Apollo x8p allows music engineers, producers, and project studios to track, overdub, and mix with new world-beating A/D and D/A conversion, HEXA Core UAD plug-in processing, and 7.1 surround sound monitoring* — all in a sleek rackmount Thunderbolt 3 audio interface for Mac or PC. Built upon UA’s 60-year heritage of audio craftsmanship, this 18 x 22 interface distinguishes itself with eight Unison™-enabled mic preamps, providing authentic emulations of preamps from Neve, API, Manley, Helios, SSL and more, plus all-new HEXA Core processing — yielding 50% more DSP for running UAD Powered Plug-Ins in real time. In addition to its elite-class audio conversion, Apollo x8p features selectable operating level for compatibility with professional +24 dBu gear, as well as an integrated monitor controller and built-in talkback mic. * Integrated talkback and built-in cues for easy communication and slating takes. *Surround Sound Support for Apollo X Coming Q4 2018. With 129 dB dynamic range and -118 dB THD+N, the Apollo x8p’s open, natural sound quality rivals any dedicated high-end converter on the market — regardless of price — and is the perfect starting point for applying UAD processing. Apollo x8p features new HEXA Core processing, with six DSP chips and 50% more UAD plug-in processing power than previous Apollos. This lets you run more UAD plug-ins, whether you’re tracking in real time with channel strips from Neve, Manley, or API, or running high UAD plug-in counts when mixing in your DAW. Perfect for engineers, producers and project studio owners, Apollo x8p features eight Unison-enabled mic preamps, letting you track large projects through exacting mic preamp emulations from Neve, API, Manley, SSL, and Universal Audio. ** A Universal Audio exclusive, Unison technology nails the tone of these sought-after tube and solid state mic pres — including their input impedance, gain stage “sweet spots,” and the component-level circuit behaviors of the original hardware. Of course, a hallmark feature of Apollo is its Realtime UAD Processing, letting you run the full library of UAD plug-ins with near-zero latency. Apollo x8p includes the Realtime Analog Classics Plus plug-in bundle, so you can record and mix with the world’s only authentic Teletronix LA-2A, 1176LN, and Fairchild compressors, the Unison-enabled UA 610-B Tube Preamp & EQ, and guitar and bass amps from Marshall and Ampeg. Going beyond the included Realtime Analog Classics Plus plug-ins, Apollo x8p lets you tap into the full UAD Powered Plug-In library of name-brand vintage EQs, compressors, reverbs, tape machines, channel strips, and more — at near-zero latency, regardless of your audio software’s buffer size and without taxing your computer’s CPU. With exclusive emulations from SSL, Neve, Studer, Manley, API, Ampex, Lexicon, Fender, and more,** it’s like having a studio full of iconic analog gear, in a single rack space. And unlike competing interfaces, these award-winning DSP-powered plug-ins are also available in your DAW for mixing. With comprehensive surround monitoring support for formats up to 7.1, Apollo x8p is a boon for engineers and producers working on audio and music for video games, television, and the web. In addition, Apollo x8p offers selectable +24 dBu operation for out-of-the-box compatibility with professional mixing consoles and other high-end pro audio equipment. Apollo x8p offers 18 x 22 simultaneous inputs/outputs (8 x 8 analog I/O) and two built-in Thunderbolt 3 ports. This allows users of any Thunderbolt-equipped Apollo Twin or Apollo rackmount audio interfaces to easily combine up to four Apollos and six total UAD-2 devices — adding fast, high-bandwidth I/O and DSP as your studio grows. *Surround Sound Support for Apollo X Coming Q4 2018. 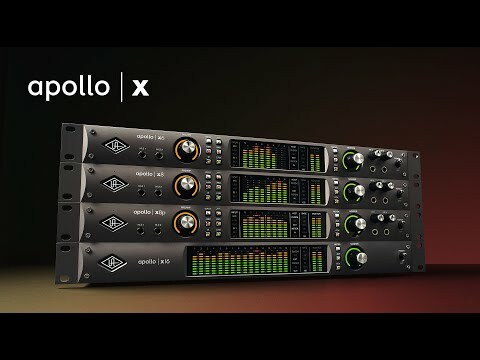 **Apollo x8p includes the “Realtime Analog Classics Plus” UAD plug-in bundle. Other UAD plug-ins sold separately at www.uaudio.com. All trademarks are property of their respective owners.